The Roanoke Valley-Alleghany Regional Commission (RVARC) website now contains the Google Translate Widget which is located below the “Latest Updates” sidebar. 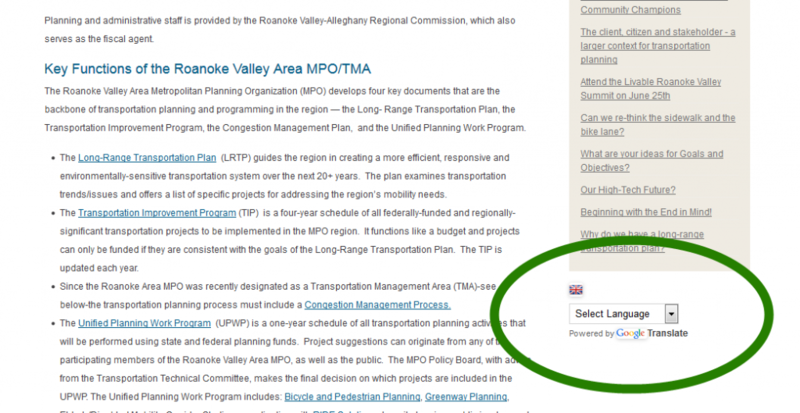 This includes the pages related to Roanoke Valley Area Metropolitan Planning Organization (RVAMPO) work. This is a part of our continued efforts to involve all stakeholders, including those with Limited English Proficiency (LEP) in our planning process. Planning is a collaborative endeavor where we co-create compelling visions of our community’s future. All interested citizens should have the opportunity to join us in the planning process. This entry was posted in Transportation and tagged Public Involvement, public participation, Title VI, Limited English Proficiency, LEP on July 18, 2014 by admin. The Roanoke Valley-Alleghany Regional Commission is working with area stakeholders to develop a Regional Food System Plan to promote and expand existing local food systems in the greater Roanoke Valley and surrounding areas. Our first stakeholder meeting will be held on July 31st at 9 am. Area groups that may be interested in participating in this meeting are encouraged to contact the Commission at rvarc@rvarc.org or check out our new website devoted to Local Foods. What is food system planning? 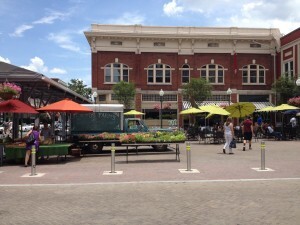 The expanded Downtown Market area in the City of Roanoke. Food system planning is gaining recognition as an integral area of interest for local governments. 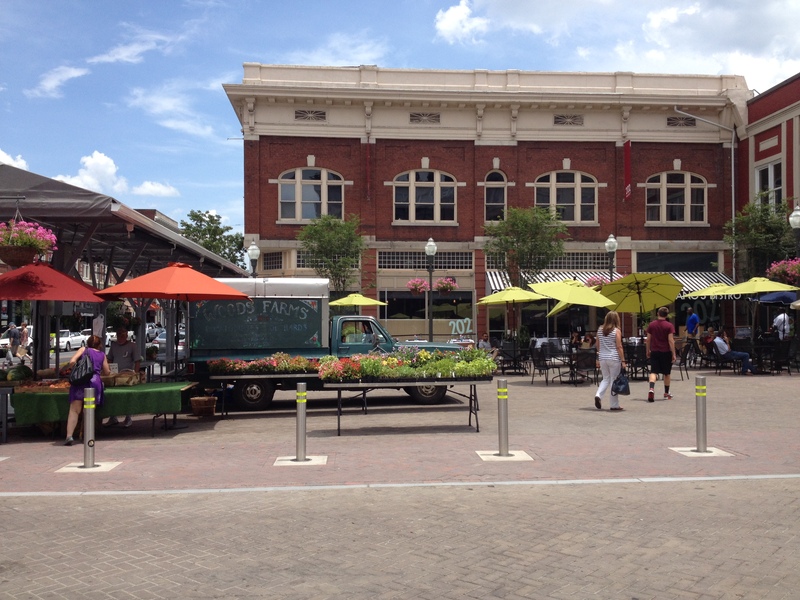 Learn more about food system planning and its importance to economic development by reading through some of the resources on our website, including the APA Policy Guide on Community and Regional Food Planning. Food system planning seeks to spur local economies by supporting local businesses and farmers; to preserve agricultural and natural landscapes by encouraging sustainable farming practices; and to improve access to healthy food items such as fresh produce in our local markets and stores. If you cannot attend the meeting or are a citizen interested in learning more about local foods, consider checking out some of the resources on our webpage. Use our Local Foods Map to find markets and farms, or look through our list of area nonprofits who are working on food projects in our community. More information can be found on our Local Foods webpage. This entry was posted in Blog on July 10, 2014 by Matt Miller. The Regional Commission is working with a stakeholder committee composed of local governments, non-profits, paddlers, fishermen, local outfitters and watershed groups to develop the Roanoke River Blueway, a 45-mile water trail on the upper Roanoke River. A blueway (also known as a water trail, paddle trail, or float trail) is a navigable waterway with sufficient capacity (flow, depth, and width) for successful progress of canoes, kayaks and other non-motorized vessels, with sufficient access and amenities to facilitate other recreational uses of the waterway. 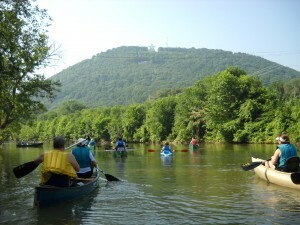 The Roanoke River Blueway flows through or borders the Cities of Roanoke and Salem, the Counties of Montgomery, Roanoke, Bedford, and Franklin, and the Town of Vinton, providing river access for canoeing, kayaking, fishing, tubing, wading, wildlife viewing, and other recreational opportunities. The Blueway also connects to numerous local parks; Roanoke River Greenway, Tinker Creek Greenway and Mill Mountain Greenway; Blue Ridge Parkway; Explore Park; Smith Mountain Lake; and businesses proximate to the river. The overall goal of the Roanoke River Blueway project is to facilitate and encourage recreational use of the Upper Roanoke River and tributaries by residents and visitors. Additionally, the project seeks to encourage watershed awareness and sustainable stewardship of the region’s water resources. To date, the Roanoke River Blueway stakeholder group has developed a website, interactive and printable maps, brochure, and other information to facilitate the safe and enjoyable use of the blueway including river access descriptions, hazards and portages, recommended minimum and maximum streamflow levels, contact information, and links to useful websites. Moving forward, the Regional Commission, local governments, and the Roanoke River Blueway stakeholder group will work to improve and promote the blueway; seek grant funding and other financial support; work with local outfitters, businesses, and other entities to promote the blueway and increase river related recreation and tourism; and increase watershed awareness. This entry was posted in Blog, Latest Updates on July 8, 2014 by admin. Would a Clay Tinted Shoulder Work Here? Interstate 66 in Northern Virginia has recently added clay colored surface treatment to the shoulder to allow traffic to use the shoulder during rush hour. It is difficult to explain how this works in words so here is a video from a TV station in the area. Do you think that such an approach would work in the Roanoke Valley? Would it work in the future when there is more traffic? Would it work on I-81? Would it work on I-581? Would it introduce safety issues our area? Would it provide any spillover benefits such as saving money, or making the area look more urban and advanced to visitors and economic development prospects? Please answer these questions and provide your own ideas in the comment boxes below. Let’s get a conversation going. 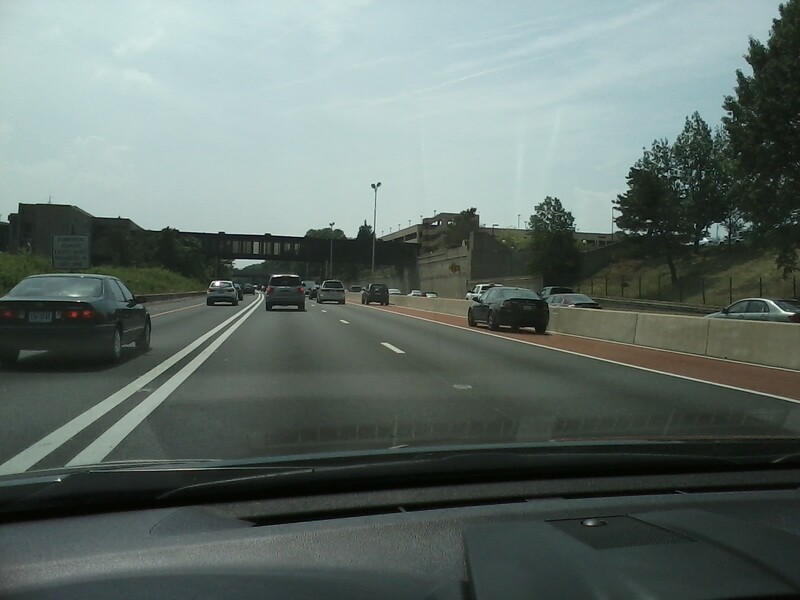 This entry was posted in Transportation, Latest Updates and tagged ITS, Operations Management, Shoulder, Shoulder Running on July 7, 2014 by admin.